The beautiful, bright blue, mile-high holiday paradise of Lake Tahoe, straddling the border of California and Nevada in the United States, is the second largest alpine lake in the world. The lake, perched atop the Sierra Nevada, is surrounded on all sides by world-class ski resorts, magnificent golf courses, first-class hotels and casinos, which cater for millions of holidaymakers every year. Although the area's scenery and facilities draw visitors on holiday year-round, it is as a skiing and snowboarding destination that Lake Tahoe really thrives. Recently most of the popular resorts, with appealing names like Alpine Meadows, Heavenly and Squaw Valley, have undergone extensions and face-lifts. 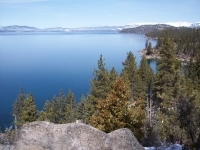 The comfortable resorts, bolstered by the fact that Lake Tahoe guarantees 300 days of sunshine a year, 33 feet (10m) of annual snowfall, unrivalled scenery and more than 17,500 acres of terrain to explore, make it nearly irresistible for anyone contemplating a winter sports holiday in California. For a holiday at Lake Tahoe, visitors can fly in to the nearby Reno/Tahoe Airport, or drive on all-weather highways from Reno, Sacramento, San Francisco and Los Angeles in just a few hours, for a dose of fun in the pure mountain air. Lake Tahoe's winter wonderland offers perfect powder, groomed snow covers the slopes from November through to April. The snow can be enjoyed at any of 15 alpine and 13 cross-country ski areas, encompassing world-renowned ski resorts. At South Lake the best known are Sierra, Kirkwood and Heavenly, all offering steep, deep and scenic runs; on the North Shore is Squaw Valley and Alpine Meadows. The total ski terrain of more than 17,500 acres offers hundreds of runs catering for all levels of skiers and boarders, from powder in the trees, moguls and open bowls to perfect corduroy cruisers. Some of the area's more famous runs provide adrenalin-pumping challenges for advanced skiers. All the resorts offer ski instruction and child-care facilities. There is an abundance of shops in the holiday resorts and towns around Lake Tahoe, and it is easy to explore them all by making use of the free trolley shuttles and cheap surface transportation options in the area. Great bargains are to be had at the various factory shops in South Lake Tahoe, situated at the junction of Highway 50 and 89. The bustling Swiss-style Cobblestone Center in the centre of Tahoe City and The Boatworks Mall at Tahoe City Marina, North Lake Boulevard, are treasure-troves of interesting stores and galleries. Good buys in the area are gold and silver jewellery, Native American art, crafts, gifts and souvenirs, and of course, outdoor recreational clothing and equipment. With literally hundreds of restaurants and eateries to select from in the Lake Tahoe area, the main problem for hungry holidaymakers is what to choose. Most are well satisfied with the top quality restaurants in their particular resorts, but the options are unlimited if one decides to move further afield. A favourite in South Lake is Sprouts, the go-to spot for salads and sandwiches that are both healthy and delicious; if comfort food is what you crave, South Lake is also home to Mac Duff's Pub, serving up generous portions of fish and chips, burgers and general pub fare. On the north shore in Tahoe City is the casually elegant Christy Hill, featuring a spectacular view of the lake. With a varied menu of homey dishes, Fire Sign Cafe is a well-loved favourite for breakfast and lunch in Tahoe City. Whatever takes your fancy in the way of living it up is available in Lake Tahoe, from gambling or shooting pool to watching a raunchy cabaret show. The numerous casinos, concentrated on the south shore, provide non-stop action way beyond the tables and slot machines, in satellite bars, clubs, restaurants and lounges. Himmel Haus in South Lake is a German beerhouse that serves up an impressive range of German and Belgian beer and wine, along with bavarian-inspired dishes, they also host multiple weekly events. One of the hottest Lake Tahoe clubs is Peek, in Harrah's Casino, offering great drinks, music and dancing till the early hours. Opal Ultra Lounge can be found at Montbleu Resort and is also a late night favourite. All the Lake Tahoe holiday resorts are dedicated to ensuring their guests have a brilliant time, both on and off the ski slopes, with a staggering number of activities on offer. Besides the 15 alpine and 13 cross-country ski areas available, snow fun can be had skating, snow-mobiling, snow-shoeing, ice climbing, sleigh riding, ballooning or even playing snow golf. Indoors there are spa treatments to be enjoyed, casino games to play, rock walls, bowling alleys, movie screenings and organised entertainment of all sorts. In summertime the Lake Tahoe menu expands to include every imaginable outdoor pursuit, including kayaking on the lake and sunbathing on the beaches. Unless you are approaching it from the East Coast, Lake Tahoe is a little tricky to get to.